May Promotion: Are you ready to Enter Gambling HQ? This May, Palace of Chance is showing you around the one and only Gambling HQ, and you don’t even need to know the secret password. If it sounds too good to be true, you’re in for a surprise! It doesn’t matter which game you prefer, this is your one-stop shop for everything gambling. So, are you ready to join the crowd in the most exclusive and lucrative gaming scene on the web? If so, now’s the time to start your journey towards a big win. When you start your gaming experience with bonuses this good, you won’t be able to avoid feeling like you’ve already won. 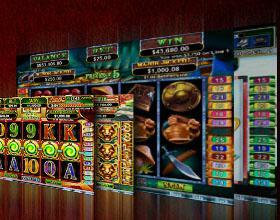 Take a turn towards the slots and enjoy a 560% bonus on every deposit of $70 or more. With a 30 times playthrough restriction and a 10 times max cash-out limit, this bonus is also available on keno. If you prefer to play without restrictions, the 350% bonus is the perfect option. With no playthrough or max cash-out limits, you’re free to maximize your winnings with every deposit of $50 or more. If you’d rather take your gambling fun over to the tables, you won’t want to miss the generous 160% bonus offer, which can be used on nearly every game in the casino. With no restrictions, your deposit of $30 just got maximized, and you haven’t even placed a bet yet! Want to feel like you hit the jackpot all month long? Simply use the gigantic 300% bonus offer on any slot machine or keno game, and you’ll be on your way to a $10,000 free casino chip! Yes, you read correctly! This month we’re giving away a $10,000 Free Chip with no playthrough or cash-out limits, all you need to do is wager the amount of your deposit and the bonus 120 times or more, and you’ll have a ridiculously generous chip coming your way. If you think regular players have it made at Palace of Chance, you’re not going to believe the offers that VIPs can take advantage of this month. For slots and keno, players can choose between a 630% bonus with a 30 times playthrough restriction and a 10 times max cash-out limit and a 370% bonus with no restrictions. If you prefer another game, the 230% bonus should do the trick. With no playthrough or cash-out limits, your bankroll just got a powerful boost. There’s little doubt about it. It pays to be a VIP! There’s no time to wait! Gambling HQ is available for a limited time, and you don’t want to miss out on these lucrative offers. With deals this good, your bankroll will be sure to thank you. If you’re ready to become a VIP, contact our Customer Service department via the Contact Us page of our website. With plenty of great games, unbeatable promotions and the best customer service in the industry, you’re going to enjoy your time at Palace of Chance!